Lately, The Hubby and I have been getting lazier about going downtown for dinner, especially when it’s just the two of us on a regular night. This means we’ve been venturing north more often for food. All the free parking is also pretty appealing. 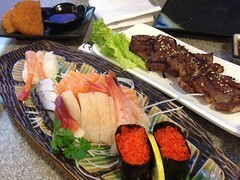 Hub Sushi was on of the Thornhill restaurants we discovered and one of my new favourites. 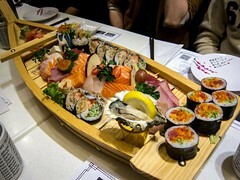 Atmosphere: I called Hub Sushi just before leaving our condo to make a reservation for that night (in 30 minutes). When we arrived, the restaurant was half full and I figured the reservation wasn’t needed. By the middle of our meal though, there a queue out the door and I was glad we got our table early. The restaurant was compact and artfully decorated with lots of greenery and cute knick knacks. It felt like I was in an Asian cafe more than a Japanese restaurant. Service: The only disappointing point about dinner was how understaffed the restaurant was. With a full restaurant, there were two girls running around taking care of all the tables. While not quite as bad at Akane, it was a slow ordeal to place our order and have our tea refilled. I watched the girl with the teapot going from table to table, running out of tea halfway and then get flagged down for something else. All of dishes arrive at once and it was a challenge to fit every dish on the table. One more server would’ve helped the pace of service greatly. Aside from being rushed, our server was friendly and had lots of smiles when we saw her. 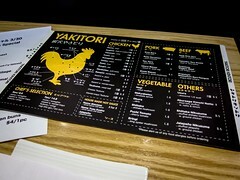 I also liked how they had a photo album of each menu item that accompanied the menu. There was also an offer of free mochi ice cream if you posted a photo on social media using their hashtag. Food: When it comes down to it, I’m a sucker for good quality food at a good price. Despite service hiccups, if the food was awesome and I think it was a good deal, I’ll be back; and the sushi at Hub Sushi did win me over. The Hubby and I chose to order the Dinner for Two ($39) , which came with 10 pcs of sushi, 10 pcs of sashimi, tempura and our choice of a special roll. 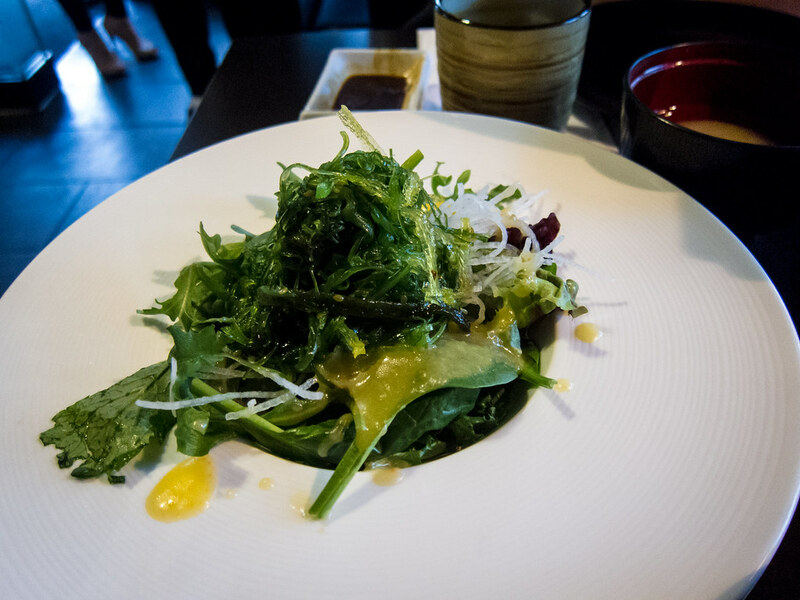 We also added on a wakame salad. 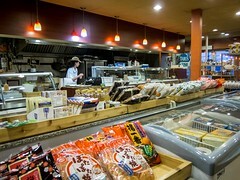 I was impressed with the quality and selection of fish. 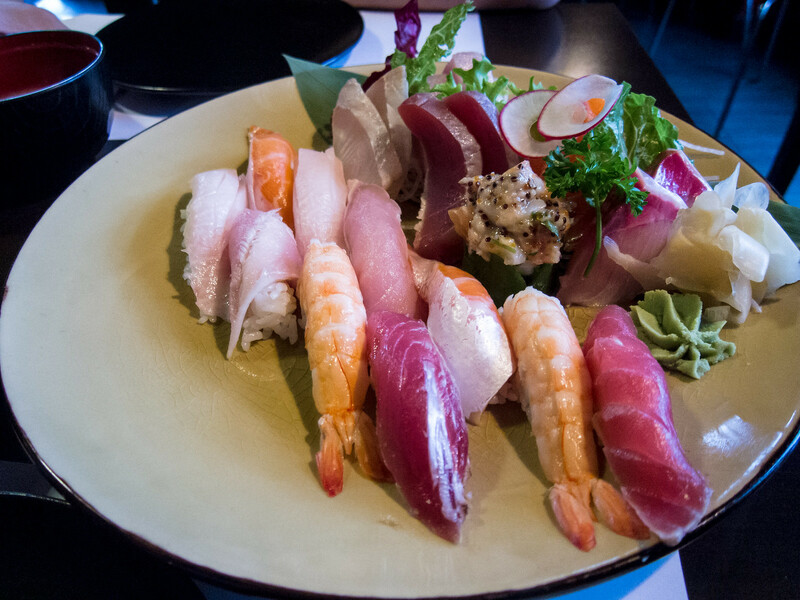 The sashimi slices were thick, buttery and sweet. 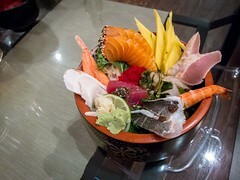 There was salmon belly, seared tuna, red snapper, mackerel and shrimp. Considering the price, this was a steal. I would’ve valued just this plate at $30 easy. 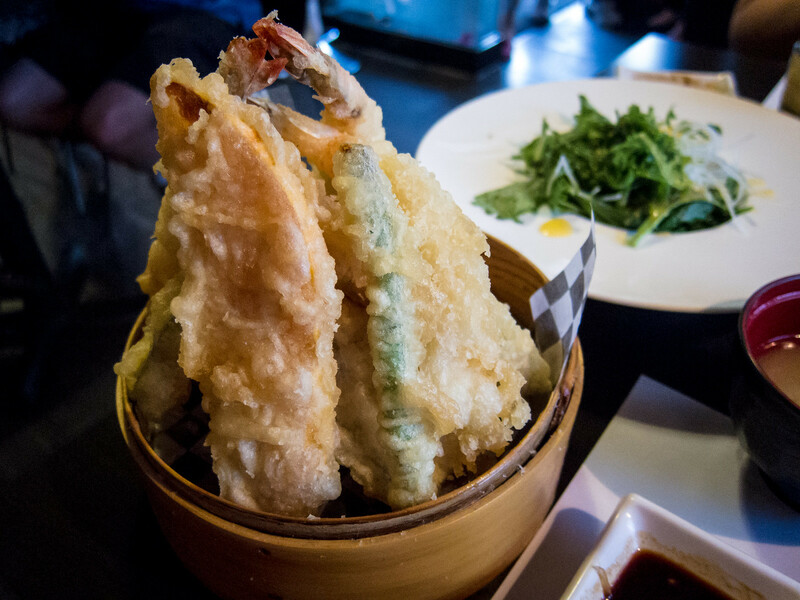 The wakame salad was served on a bed of greens drizzled with a citrus dressing followed by a basket of tempura arranged in a dim sum steamer. Hub Sushi plated their dishes with some care and I appreciated the sentiment. Given our small table, the salad plate took up a lot of real estate. I found the salad up to par and the tempura disappointing. The batter had a strong oil flavour and wasn’t light or crispy. Being a great blogger, I can’t recall the exact sushi roll we chose but there was a fried element (soft shell crab), tobiko and avocado. Each bite was delicious with lots of flavour and a great balance of crunchiness and creaminess. 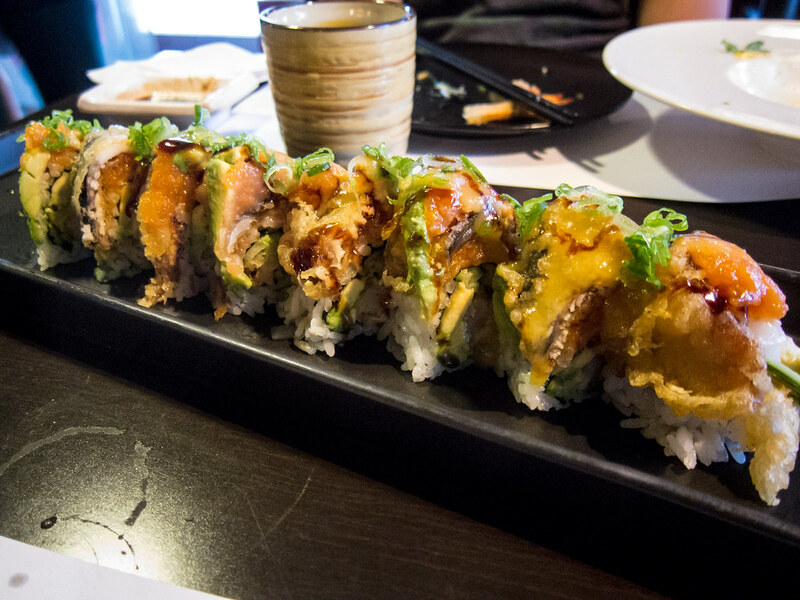 Overall, Hub Sushi is a great spot for sushi North of the city.